It's May, how did that happen? I rather unintentionally have not posted for over a month. I guess I needed a break and I suppose I HAVE been working on redesigning the look of the site, so I wasn't truly "away". I have also been trying to multitask less, yes you read that correctly...less. I have determined that I am a really good multitasker (I don't really say this with pride), I can get quite a bit done if I set my mind to it; a realization I have had since becoming a mom. However, I have also determined that multitasking kills my joy and leaves my brain feeling like it is encased in a thick fog. So in the pursuit of being present and having gratitude, I decided that I actually need to be in the moment and not flying through thinking about the next thing I "have" to do. It is a difficult mental shift and my to-do list may suffer, but life is more than a checklist, which is hard when it is so engrained in our culture to be productive. 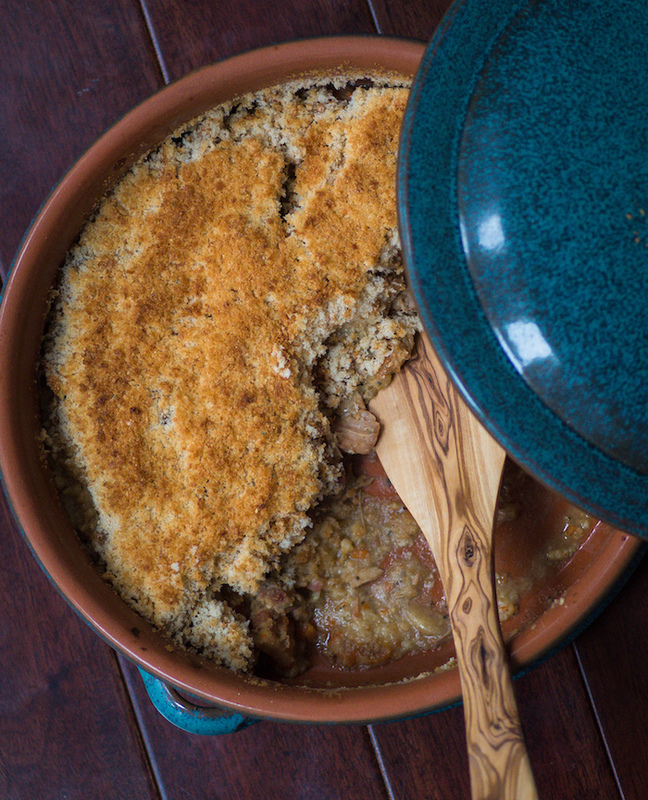 This does mean that I have started to favor quick meals and for those that have made cassoulet, you may be thinking that it doesn't fall into the "quick" realm, but I have recently converted my recipe for this dish to an electric pressure cooker (in my case the Instant Pot). So what normally took 6-8 hours in the dutch oven, now takes 1-1.5 hours and about half of that time is inactive. I have never been a crockpot fan and while I like the idea, most things ended up dry or less than ideal (maybe it's me though). So the dutch oven has long been my friend, but dishes like this one still require long cook times and somewhat of a watchful eye. 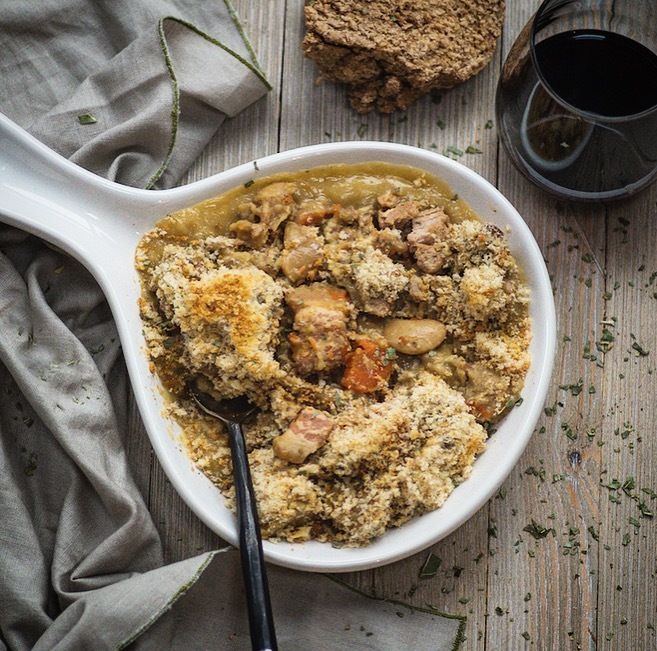 The Instant Pot, however, cuts the time down to nothing and the results are pretty amazing - maybe even better than the dutch oven method. 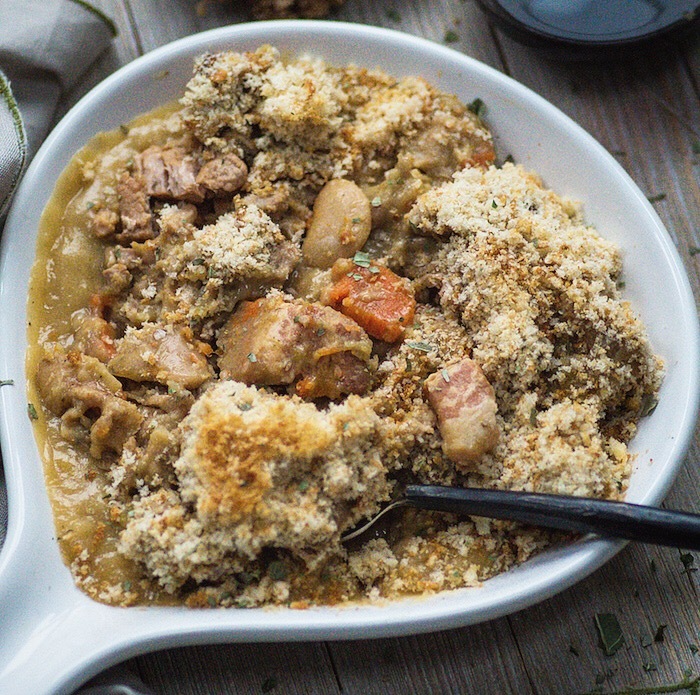 Recipe for cassoulet adapted for the Instant Pot. Turn the Instant Pot to "saute" and heat the duck confit until melted (or oil if you prefer not to use the confit, but I strongly urge you to use the confit). Brown the cubed salt pork, then remove from heat and set aside. Then brown the cubed pork shoulder, remove and set aside. Lastly, cook the carrots, onion, garlic and celery until onion is translucent. Then add back salt pork and pork shoulder and add the rest of the recipe ingredients (minus the bread crumbs & flour) and turn off saute. Following the Instant Pot instructions, secure the lid and turn the pressure release to sealing. Then select the meat/stew button and let it cook for the specified time (about 35 minutes). Once cooking is complete, you have to wait for the pressure to release naturally or by using the "quick release" method (which I often do), but judge according to your instructions and experience. There will be a lot of liquid remaining, so strain this from the rest of the stew and set aside. Also, remove the bay leaves and sprigs of thyme and discard. Place stew in a deep casserole/baking dish and heat the oven to 400F. To make the "gravy", add flour and about 1/2 cup of the liquid you set aside in a sauce pan on the stove and make a paste stirring with a whisk over medium-low heat. Then take 1 - 1.5 cups of the liquid and very slowly add a little at a time to flour paste while whisking continually so that it stays thick, but does not get lumpy. If it does get lumpy, my cheat is to throw it into the Vitamix/blender, then back to the pan - this may not follow the "rules," but it gets the job done. The consistency should be a thin gravy, which you will pour over the stew sitting in the casserole dish. Then top with bread crumbs and bake for 15 minutes.